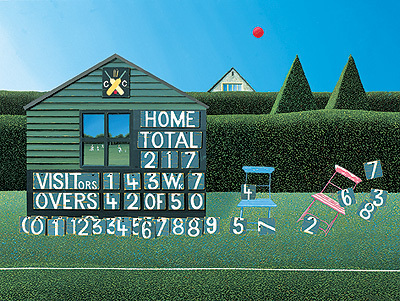 The action of a cricket match is glimpsed in the image reflected by a window while the focus of the painting is the scoreboard and the spare number cards scattered by the cricket ball. This disarray contrasts with the order of the very manicured hedge and shrubs in the background. Michael Kidd art shows a strong imaginative streak in his art work, quirky at times, surreal at others. His painting style is precise, using acrylic on board to produce contemporary paintings with clean, clear lines and high definition. Each Michael Kidd limited edition print has been created by the print publishers using the finest techniques and materials. And, every print has been carefully produced to faithfully capture the essence of the original painting into a Limited Edition. All Michael Kidd signed limited edition prints from Red Rag Art Gallery have been reviewed by the artist. This guarantees that all prints offered by Red Rag satisfy the high quality and fine art standards set by Michael Kidd for prints.